I was a fairly voracious reader as a youth. I read a large number of Tom Swift books and was always looking for books that taught me things about life (such has space ship design from Edward Stratemeyer’s Tom Swift). One such book was Cheaper By The Dozen, a story of what it was like to live with two time and motion study experts for parents. Though I vaguely remember actively trying to incorporate some of what I was reading into my life, it wasn’t until recently that I realized how much of my habits were dictated by the logic and reasoning conveyed in that book. How I must be doing things most other people are not doing. For as far back as I can remember, it has never occurred to me to stand still in the shower waiting for my shampoo and then conditioner to have its effect. Is that what research says most people do? 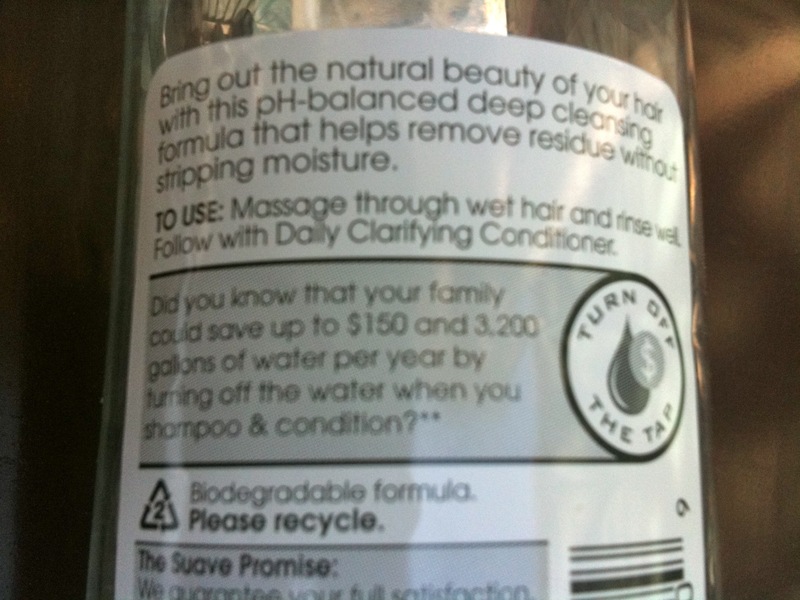 What else would motivate the “Turn Off The Tap” tip on this bottle and millions like it? Why aren’t people doing the next important thing, such as soaping their bodies? Who in their right minds turns on the tap to wet their toothbrush (a nonsense habit to begin with), and then leaves it on while they brush their teeth? Evidently enough to warrant using tax dollars to fund an EPA program called WaterSense to educate kids, parents and teachers on how to conserve water. I could go on with all sorts of other examples where people waste their time and our limited resources, but it’s depressing to spend too much time on the evidence of how few people think as they go through their lives. And I am no shining star, I waste a lot of time during the day, at least according to my wife on the days when she is around to watch me. The summary lesson I suggest you ponder on is this: evaluate. Routinely evaluate every habit you have, every tradition you carry out, reconsider everything you do every once in a while to be sure what you are doing makes sense, and is the most efficient and least wasteful way to do it. Does it make sense to leave things in a different place every time you use them so you have to waste time looking for it the next time (much less infuriate those who always put it back in the same place so they could find it blindfolded it they had to)? Does it make sense to not take a moment before putting produce back in the refrigerator to properly wrap it so it will still be usable when you need it again? Is there any reason to throw out (recycle – supermarkets often take plastic film back) food bags other than holes or dirty beyond being able to be cleaned? Take the 5 minutes at the end of every day to clean the dozen or so zipper-seal plastic bags you used that day! Maybe people don’t realize how much can be recycled. It’s darn close to everything these days! Due to the vast disparities among the capabilities of recyclers, there is no way to give guidelines here, other than to say do the research. If the list of allowable materials is not immediately apparent on your community’s vendor’s website, call or email asking that it be made so. If your community negotiates the disposal and recycling contracts, speak with your DPW director about what can be sent out to homeowners and businesses to encourage more recycling among your neighbors. We all know that there are thousands of websites that cover in detail both of these topics, to do that again is not my intention. Instead, I was motivated to write this merely to ask you—close friend or social media acquaintance—to think about what you do from a new frame of reference, that of efficiency and minimal waste. In Scouting we were taught a program called Leave No Trace. I have since found that it is an international movement toward “outdoor ethics,” but the principles applies in the context of this idea of efficiency and reduced waste: responsible enjoyment and active stewardship. Enjoy the resources you are blessed with (time, employment, food, pets, water, a kitchen, etc. ), but not at the cost of others. And play an active part in stewarding all our resources. Pick up trash that you see on the ground as you walk your dog (as well as any ‘deposits’ your pet leaves behind), make recycling containers easy to access in your house, you know the drill—THINK!